When it comes to books Blake has quite a collection of different types from general story books, lift and flap books and touch-y feel-y ones. He loves to sit on my lap and listen to me read to him on a daily basis and I make it part of his routine during the day to have story time. He has recently started getting into his sticker book which one of his friends got him for his first birthday so when I was given the option of choosing a few kids books from Carlton Kids I chose some creativity books as they will be ideal for him as he gets older. The ones I chose are the monster creativity, dinosaur creativity and the cars, trains and planes creativity books. These are all themes I know that Blake will love. He is especially into cars, trains and planes at the moment. At the moment I feel Blake is too young for most of the activities in them but I feel he will be able to have fun with the stickers and possibly the stencils once he is a little older. Carlton Books have a fab range of books that are suitable for boys and girls and I would recommend you check them out. Do your little ones love books like these? They look fabulously fun - I love the idea of the dragon one! These would keep my nephews busy for hours! I really love activity books. They allow you to always have something to do. My little sister is a very creative kid so she would love the Carlton kids books. I think it is important to foster creativity from a young age! I've never seen these books before but they sound like a great idea! These books look like great fun for little ones. When Jenny was in hospital she developed a love for these sticker books. She still loves them! Lots of fun. These books look fab! Love the activities and how bright and eye-catching they look! 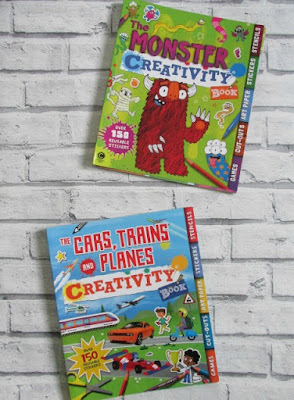 These books look fantastic fun!